My wife and I have a lot going on. We work together on this business of mine, and Anne has her own business dealings as well. We also have two kids, so we have other people in our household that require our time, attention, and focus. As our kids have gotten older, their needs have changed, so nothing at home really stays the same. In fact, nothing about our lives ever really stays the same. In the past, whenever my wife and I had time together, we would use those fleeting moments to talk about what each of us had going on that the other needed to know about. Things like who was going to cook dinner over the next few days, what elements of this business needed discussion, and how we were going to attend our daughter’s school concert while still keeping our son entertained. By the time we would discuss these different areas of our lives, our brief moments together were spent. The demands of our lives came calling, and we headed off in different directions to deal with them. At the end of the day we wanted to passively be together in the same room without anything other than the occasional glance at each other. I wanted to be more intentional about the moments we spent together. Essentially, I wanted to bring elements of what I believe and teach about personal productivity to this area of our lives. After much discussion, I found a way to allow my wife and I have moments of deliberate household and business management rather than having scattered conversation at random times throughout the week. Now we spend time together where we just enjoy each other’s company with little to no agenda at all. Basically, I have a meeting with my wife every week where we discuss those things we must consider on a regular basis to run our lives, our family, and our businesses better. Where we discuss things like meal planning, fiscal responsibilities, and other elements of creating a happy and healthy home life. I call it The F’ing Meeting. And it is the most valuable meeting I have on my schedule. The way the meeting works is that my wife and I schedule it at minimum once every two weeks. We try to have it every week, but due to travel schedules and such, that isn’t always possible. The F’ing Meeting takes place at the same time on the same day every time. I look at it as something that is unmovable. Again, if we can’t meet weekly, then it’s better for us to skip the week then to try to move it to another day. Consistency is the key here. Because I work from home and I’m an entrepreneur all three of these topics work for both business and home life. Let’s look closer at each area. When it comes to this topic, we tend to review things like meal planning, grocery shopping, and any scheduling issues that will affect meals over the next two weeks. For example, if both kids have some sort of event going on after school, that shortens the amount of time we would have to cook something. We may need to cook something either in advance or use the Instant Pot to have a cooking for a longer period of time throughout the day. In addition, I tend to use my sous vide cooker while I am spending time with the kids. That way I don’t have to concern myself with watching the food while it cooks. As you can imagine, we review recipes first and then put the grocery together. There have been moments where we have considered using a service like Geoff Pages hectic meals for planning – and it is something we regularly consider to this day. However, even if you have a resource like that sitting down to discuss meal planning is something that allows us to save time, money, and energy throughout the week. The topic of finance actually bleeds over into the first one. After all, if our finances aren’t sorted out, then we have no idea what we can spend on groceries, right? That’s why we don’t necessarily cover all of these topics in the order I have listed them. But I’ll talk about that more in a bit. When we get to this area the conversation, we start to talk about the financial situation for both the business and for our family. This topic can lead to a long conversation at times, but because we have done it so consistently and regularly, the time spent on the subject tends to get shorter over time. A great byproduct of this meeting is that we can actually use our regular financial discussions to feed greater ones, such as what we want to do for travel or improvements we would like to make around the house. My wife is definitely better with money than I am. However, by making this a topic of discussion during our meetings, I am becoming better with money as well. It’s definitely more of a challenge for me, but I find it these regular meetings help. If anything, they foster awareness. And that’s a great first step. While the other two subjects have something to do with family, spending time on this category is more about what each member of the family has going on over the next week or so. Things like field trips for the kids, travel for myself, outings for any of us, are brought up during this part of the meeting. To be honest, this is the subject that seems to have the least amount of time spent on it during the meeting, but without it in place, I’m sure things would definitely fall through the cracks. I would say they’re out of the three areas, this is the one that we discussed first. It’s short, it leaves the foundation for the other two areas, and it places importance on the most important reason we are having these meetings in the first place: each and every member of the household. Investing attention on these three areas of our lives creates a compounding effect that ultimately results in a fourth “F”: Focus. No longer do I need to wonder what we’re having for dinner. We’ve planned that far in advance. We have a greater understanding of our money situation now because of this regular meeting – something I’ve never had before. We can keep our spending aligned with our long-term goals for both work and family. We’re both in the loop about family activities. I know when I need to be somewhere, as does my wife. Admittedly, I was in need of this component far more than Anne was. But the result of this has been an increased awareness for me about why I craved the freedom and flexibility that entrepreneurship can offer…so I can spend more time with those I love. As I mentioned earlier, we don’t necessarily discuss the three areas in the order I listed them. Sometimes we need to discuss money before food. Sometimes we need to discuss family before food. We have some variety built into the framework because many of these areas have an “if/then” component. The best thing the meeting has done is afforded my wife and I time to just go out and date. We do not have to concern ourselves with talking about home and business endlessly. We cover that stuff during these meetings instead. So when my wife and I want to have a date night, we are able to focus on the date and each other. 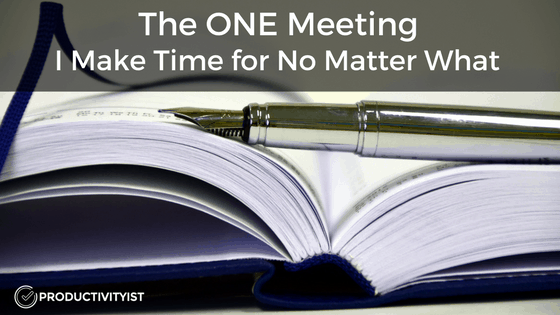 Meetings don’t have to be a waste of time. I would go as far to say that a lot of meetings that you have aren’t. But if you want to have one of the more meaningful meetings you could have, consider having this one. It is well worth your time.